Generations at Oakton offers an occupational therapy program that assists residents in becoming self-reliant in activities of daily living. This might include dressing, personal grooming, eating, and more. The goal of an occupational therapist is not only to help clients improve basic motor functions and cognitive and emotional abilities to return to their roles but also to compensate for loss of function. The occupational therapist’s goal is to help clients have independent, productive and satisfying lives. 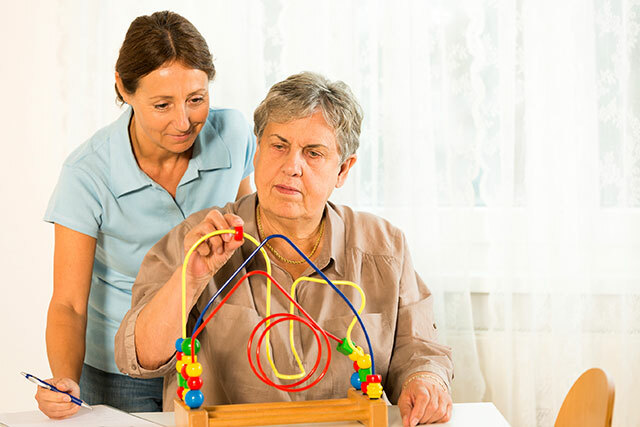 Occupational therapy practitioners are skilled professionals whose education includes the study of human growth and development with specific emphasis on the social, emotional, and physiological effects of illness and injury. Who Should Participate in Occupational Therapy? Seniors who are struggling to perform activities of daily living would benefit from occupational therapy. Why Choose Generations at Oakton for Occupational Therapy?